When a child is disrespectful to teachers or classmates, the first source to consider is the behavior of the adults in this child's life. Children who aren't treated with respect have no model for respectful behavior. Joe's parents call each other names, belittle Joe, and sneer when he objects to anything. When Joe behaves similarly at school, it is unacceptable. Joe needs training, experience, and examples of respectful behavior. Self-respect is the other important aspect here. The teacher who passively allows a child to belittle her or call her names isn't modeling respect for herself. She must tell the child, "I won't continue to listen to disrespectful language," and then calmly walk away. Please note that the teacher does not say, "I won't allow you to call me names." The former statement clearly states what the teacher will do, not what she will try to make the child do or not do. The difference is critical. With the first response, the teacher shows respect and models self-control without trying to control the student. It is likely to produce improved behavior, especially if followed up with a dialogue when both teacher and student are calm again. Contrast this response to lecturing, blaming, and threatening, and then decide which response you would prefer if you were the student. For another important clue to the source of this misbehavior, consider how widespread the displays of disrespect seem to be. One wise administrator said that if a classroom has two or three problem children, then there are probably two or three children with problems; if a classroom has five, six, or more problem children then there may very well be a problem teacher. A wise university professor stated that all teachers have problems with students. Conversely, all students have problems with teachers. Every teacher knows that some classes are more difficult than others. Whatever the situation, a teacher's best tool is control over his or her own behavior. Model respectful behavior. Before approaching a situation that's making your blood boil, take a moment to calm down and regain your composure. Give lessons on respectful behavior. Demonstrate respectful ways to approach and respond to others, and let the children practice them. Encourage children by letting them know when you notice their efforts to practice new behaviors. Be specific: "Mary, you explain to Susan how much her whistling during lunch was annoying to you. That shows respect for Susan as well as respect for your own needs." Use the mistaken goal chart to decode what a child's behavior is telling you. A teacher's intuition may offer the best clue. Typically a child who is hurting others is feeling hurt herself; the goal then is revenge. Some children may be disrespectful to get attention or to show power. Identifying the likely hidden message helps the teacher figure out the best way to respond. Avoid lectures, shaming, and blaming children. Such adult tactics incite disrespectful responses. Practice mutual respect. That means remembering to respect your own needs as well as the students' needs. Take time to connect with your students. It's easy to be disrespectful to a person you perceive only as an object of your control or manipulation. Similarly, it's difficult to be disrespectful toward someone who is an asset to you or who sees you as an asset. Middle and high school teachers who use positive discipline class meetings have discovered that taking time for giving compliments, appreciations, and encouragements contributes to a mutually respectful atmosphere in their classrooms. At a class meeting, discuss the students' understanding of disrespectful and respectful behavior. Share your own thoughts. Identify and role-play ways in which people can behave respectfully in specific situations. The class might formulate a plan with a chosen focus, such as ways in which they can show respect for one another when standing in line waiting for lunch. In a few days or a week, students can discuss how the new plan is working. Take time for training. Role-play a problem situation with a child individually or during a class meeting. Allow the child to play the role of the adult and to practice both unacceptable and acceptable responses. Then encourage the child to express the feelings he experienced when in the adult role. Reverse roles, and go through the process again. Develop an atmosphere of trust by helping children to see that you are more interested in solutions to problems than in identifying or punishing those who misbehave. Learn to trust the process of working with children rather than trying to control them. Stephanie, a new teacher at the Frazier preschool, came into the program director's office in despair. Several of the four-year-olds in her class were hitting her and refusing to obey her, and this week two children had spit in her face. The director asked Stephanie how she had handled this behavior. Stephanie said she had told the children who hit and disobeyed that she didn't like it when they behaved that way. When the children spit at her, she had been too stunned to know how to respond. Finally she decided to stay out of the range of children who spit, and whenever anyone hit her the whole class had to miss recess. The director asked Stephanie whether or not she was willing to try something new. Stephanie replied that she definitely was, because these kids were so disrespectful she couldn't imagine finishing out the school year. Together Stephanie and the director developed a plan. First of all, Stephanie was going to model self-respect by taking care of her own needs. If a child hit her or spit at her, Stephanie would turn away from the offending child and remove herself from the child's range. When both she and the child were calmer, she would sit down with the child and spend some time getting to know him or her. They would then discuss what had happened and how each of them felt about it. Together they would discuss how they might solve this problem between them. They would work on it as a team. One week later, when Stephanie reported back to the director, she was astonished at what was happening. Ever since she had begun getting to know the children personally, she had felt herself relaxing and approaching each day with less stress. The atmosphere of tension and resistance in the classroom was changing as well. By winter break, Stephanie found it difficult to believe that the cooperative and respectful children in her classroom were the same people with whom she had begun the school year. They were still far from a perfect class, but Stephanie enjoyed being with them. Stephanie had learned the power of mutual respect. 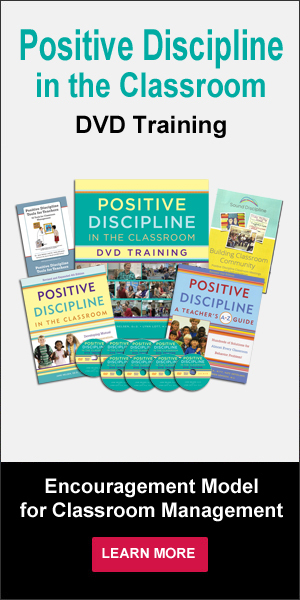 Find more classroom management solutions with Positive Discipline A Teacher's A-Z Guide. My (9 yr old) daughter came home today with an apology letter addressed to her teacher (who instructed her to do so, and have it signed by me). At recess, one of the other kids (?who) suggested that they go scream out "(insert kids name) is a douchebag." (Excuse the language.) We have a no name-calling policy at home, which my kids are fully aware of and reminded constantly (with slip ups when usually one is joking and calls another "stinky" or something). It was my daughter that yelled it, but I'm not confident that she was the one who came up with the idea. Though her choice of following through is worse than conspiring. Anyway, I'm trying to think of a suitable "punishment." Any suggestions besides the above listed? We will have a family meeting later tonight and will be planning to work on the tips listed in this article and have each family member participate. Thanks in advance! The answer to your question is based on five important foundational concepts of Positive Discipline. My answer includes all of them. Punishment is designed to make kids "pay" for what they have done. Positive Discipline helps children "learn" from what they done. Help kids "explore" the consequences of their choices, instead of "imposing consequences (poorly disguised punishments)" on them. Focus on solutions (and involved kids in finding solutions). dumb things—even when I knew better; and then felt ashamed and embarrassed." At this point you could help her explore the consequences or just go straight to focusing on solutions. Helping her explore the consequences of her choice could go something like this: "What happened? How did you feel about what happened? How do you think others felt? What did you learn from this? What ideas do you have to solve this problem now? If you decide to focus on solutions without helping her explore consequences first, it might sound something like this: "Would you like to brainstorm solutions with me, or would you like to put this on the family meeting agenda and get the whole family to help brainstorm solutions?" When brainstorming for solutions it is important to leave lots of room for your daughter to offer ideas. If she is struggling to think of solutions suggest waiting 30 minutes for some calm-down time, and then try again. It is fun to start with some wild and crazy ideas, such as, "Fly to the moon so you don't have to deal with this." Eventually she (with your help) will come up with a solution that she is willing to do—even if it is hard. Most likely, it will be an apology. An apology that is her idea will be honest and sincere (even though difficult) as opposed to a forced (shaming) apology. As you go over these suggestions, put yourself in your child's world. How would you feel if you had to experience shaming and punishment? Oh, I know that shaming and punishment may stop the behavior for many kids, but the cost is a dent in healthy self-esteem. It means doing the right thing to avoid punishment. On the other hand, how would you feel if you experienced the Positive Discipline ideas? Which would help you learn from your mistake and be less likely to repeat it—to do the right thing because of inner courage to learn from mistakes—and to correct them?